Most muscle cars during the original golden era fit a certain mold. They were generally around the size of what was considered an intermediate back in the 1960s and 1970s. There were some muscle cars that were smaller and considered compact cars. However the rarest muscle car type by far was the full-size variety. Chevrolet had its 1961-1969 Impala SS. Ford offered a muscle car version of the 2-door Galaxie. There was also the Galaxie 7-Litre and later the 2-door 1969-1970 XL – all of which were full-size cars. And Pontiac’s Grand Prix during most of the 1960s was a full-size car. Not to mention Pontiac’s more potent versions of its early-1960s 2-door Catalina especially the SD 421 version were all genuine full-size muscle cars. And the same was true with the Catalina based 1964-1967 Pontiac 2+2. However as big as these full-size cars were, they never exceeded a length of 216 inches. Only two full-size muscle cars exceeded this length. One was the 1969-1970 Mercury Marauder which had a length of 221 inches. 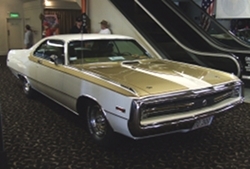 The other was the 1970 Chrysler 300 Hurst (sometimes referred to as the 300H) which by far was the biggest muscle car ever produced – it had a length of 224.7 inches, width of 79.1 inches, and a wheelbase of 124 inches. This car was so big that even in the era of large American cars it was a behemoth. The 1970 Chrysler 300 Hurst was a joint venture between Chrysler and Hurst Performance, INC. Hurst had made a name for itself during the 1960s producing aftermarket performance parts – their most popular offerings were their full lineup of aftermarket transmission shifters. Hurst’s first joint venture with an automaker (to produce a special edition car) was with Oldsmobile which yielded the legendary 1968 Hurst Olds which was the first of many special edition Hurst Olds offerings. Hurst would also build special edition cars with other automakers such as AMC and Pontiac. The 300 Hurst like every other Hurst special edition car, was intended to be a low production car. It was not typically a car that a buyer found sitting on the dealership lot waiting to be purchased, it was the type of car a buyer strutted into a Chrysler dealership and fill-out the order sheet and then waited a few weeks for the car to arrive at the dealer for pickup. And in many cases the dealership would not submit the order until a substantial down payment was rendered by the 300 Hurst buyer. After-all if the buyer reneged on the purchase of this hip muscle car that had a base price of $4,400, the Chrysler dealership which sold to buyers who were about as interested in a muscle car as a dog is in a bowl of milk, was stuck with a hard to sell car lingering around the dealer lot for a long period of time. Offering a muscle car through the Chrysler dealership network was like Cadillac or Lincoln offering a muscle car (neither of which did). So you can see how the 300 Hurst was a bold move for Chrysler. The 300 Hurst was aimed at a very tiny luxury niche – the male buyer who was over 35 years of age and was either rapidly climbing the corporate executive ladder or had already reached fairly high up the corporate food chain. The idea was that this time of buyer wanted a lavish luxury oriented muscle car. The Hurst Olds had been a step towards this market, but the 300 Hurst was the epitome of the ultimate luxury muscle car – so much so the interior of the Hurst Olds looked like a Chevy interior in comparison to the 300 Hurst’s. 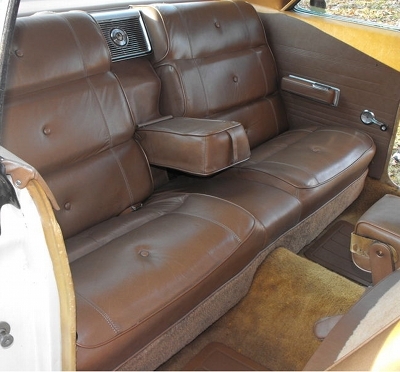 The plushest seats you were ever to going to find in an original era muscle car were standard on the Hurst 300 – Chrysler went all out by plucking the pillowy Saddle (tan) colored supple leather seats right out of the 1970 Imperial and dropping them in the 300 Hurst. And if that wasn’t enough to impress most buyers all seating adjustment were power operated for both front seats. This was back in an era when most muscle cars seats were about as comfortable as a straight jacket and inexpensive vinyl seating surfaces were the norm. Though it was possible to save a few bucks and forgo some power and convenience options – you may find a 300 Hurst with roll-up windows however this will be the exception (the backseat picture in this article shows one such rare 300 Hurst with roll-up windows). Most buyers went all out with the options so finding a loaded 300 Hurst today is more the norm. The 300 Hurst was the big elephant in the muscle car jungle where all the other potent muscle cars were either ferocious lions or tigers. It may have been the biggest animal in the jungle but it was just as mean and fast as the lions and tigers. The 300 Hurst was standard with Chrysler’s potent 375 horsepower 4-bbl carbureted wedge (head) 440 CID V8 – it was code named the "TNT" (4-bbl) 440 V8 (this motor in Plymouth models was called the Super Commando 440 and in Dodge models, the Magnum 440). The TNT 440 easily propelled the more than 2-ton Chrysler from 0-60 mph in 7.1 seconds and the 1/4 mile in 15.3 seconds. And with this motor producing a whopping 480 lb-ft of torque (which is more than most muscle cars produced during this era) – easily launched the 300 Hurst hard off the line and pulled hard enough to pin the driver into the seat back during wide open trottle. And the advertised 375 gross horsepower was more than most muscle cars produced back in 1970. Dodge and Plymouth did offer a slightly more fierce version of the same 440 (RB) big block V8 found in the 300 Hurst that was rated at 390 horsepower and 490 lb-ft of torque – it was the 440 Six Pack (three 2-bbl carburetors). Some Dodge and Plymouth muscle car models could also be equipped with the potent 426 CID Hemi V8 which was rated at 425 horsepower and 390 lb-ft of torque. Unfortunately Chrysler and Hurst both decided to refrain from offering the 440 Six Pack and the low production 426 Hemi in the 300 Hurst, so the high performance 375 horsepower 440 was as good as it got. 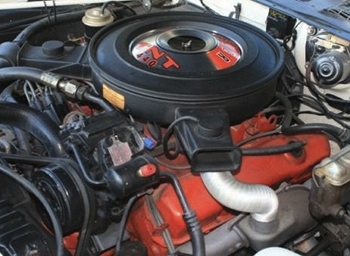 Which was probably a wise move since most of the 300 Hurst buyers weren’t the type to tinker with the temperamental (dual 4-bbl) Hemi which required a lot of adjustments. And the 440 Six Pack to a lesser degree with its three rows of 2-bbl carbs also required a little more attention than the high performance TNT 4-bbl 440. Dual exhausts (with quad exhaust tips) were standard along with a performance oriented 3.23 rear axle ratio. And falling in line with its executive image, only Chrysler’s heavy-duty torqueflite 727 3-speed automatic transmission was available. Standard on the 300 Hurst, the 3-speed torqueflite had the traditional column shifter which appealed to the majority of Chrysler buyers back in the day. If a buyer wanted to add a nice touch of sportiness to the interior a sporty center console automatic transmission shifter was optional. 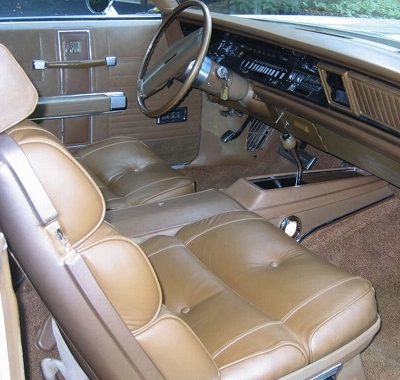 This was almost a necessity for the buyer who wanted to reflect in the interior a little bit of sibilance of this car’s performance potential – if no console shifter was ordered the interior looked like any other upscale Chrysler luxury barge back in the day. The 300 Hurst had a mandatory conservative in design rectangular speedometer – the entire dashboard design and layout was also very conservative in nature. One disappointing aspect of the 300 Hurst was that there was not a Hurst shifter option even if the console shifter was ordered. Fortunately, power steering and power brakes (front disc and rear drums) were standard. The 300 Hurst may have been a hulk of a car that didn’t mean it was softy when it came to curvy roads. It came standard with a heavy duty suspension that included stiffer rear leaf springs, a sway bar, and heavy duty front torsion bars. It’s not known exactly how many 300 Hurst editions were produced. Most experts agree that the number is somewhere between 485 to 500 units. There’s also one known 300 Hurst convertible that was produced which was used as a promotional vehicle by Hurst. There are rumors a second convertible may have also been produced. Where the Hurst special touch could really be seen was in the exterior design. 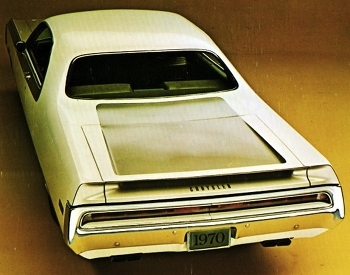 There was a fiberglass hood skin (the hood frame was steel) which included a decorative scoop – there were hood pins which were taken from the 1970 Oldsmobile 442 parts bin. And out back there was a fiberglass trunk lid which included a integrated rear wing spoiler. Yet it was the two-tone exterior paint scheme which was Spinnaker White and Satin Tan that gave this car the official Hurst look – borrowed right from the 1969 Hurst Olds. Accent striping separated these two colors and there was also a full body stripe on each side of the car. The overall Hurst exterior makeover worked, the Hurst 300 which used Chrysler’s fuselage design, managed to look the part of a true muscle car. 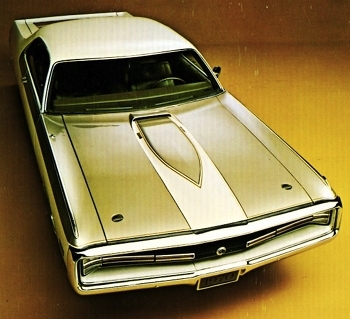 Of course the Chrysler 300’s mean looking front grill with hidden headlamps made it look like a big 1968-1970 Dodge Charger (which also had the same type of grill and hidden headlamp design). When looking at the Hurst 300 you can’t help but notice the trunk is nearly as long in length as the massive hood. 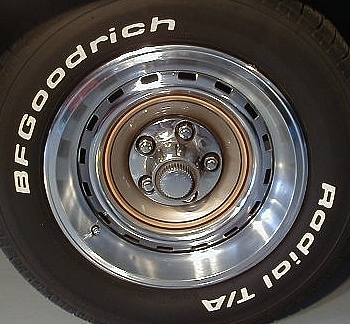 Finishing off the exterior was a set of Chrysler’s stylish 15-inch (steel) road wheels which had just enough tan to accent the exterior color scheme of the car. The interesting philosophical aspect of the 300 Hurst is that both Chrysler and Hurst had it right – they understood there was a market for an upscale luxury oriented muscle car. And if you’re not a believer take a look at the current crop of 2012 (V8 powered) muscle cars and you’ll see it’s the norm that they are loaded with options including power everything and leather seats. Though muscle cars in recent years have gone more upscale to match the luxury of the 300 Hurst, however it’s safe to say that there will never be another built as large. It’s been 42 years since the last one left the factory and it’s even bigger now when compared to the average car on the road today. But that fact still doesn’t detract the 300 Hurst from it’s original main mission as a special edition luxury muscle car. The 300 Hurst delivered back in the day some serious performance while providing the ultimate in luxury in the form of the largest mass of sheet metal. The net effect was Hurst’s partnership with Chrysler produced a car that was a blast to drive – put another way, think of the 1970 Chrysler 300 Hurst as 2 tons of fun.